Dino-Lite is a digital portable microscope that you can attach to your computer through USB port and have a zoom-in view of any object that you are interested in. The adjustable magnification design makes it much easier to use and suitable for most of the applications. Equipped with a tiny ¼ inch CMOS sensor, it is able to zoom up to 200 X with VGA resolution of 640 X 480. Although the resolution is not truly impressive, but its portability has made it most suitable for various applications ranging from daily life skin and scalp checking up to science or industrial usage. For myself, I found it to be greatly useful especially when trying to do visual inspection on the solder joints of PCB (Printed Circuit Board) and electronics repair work in the lab. By connecting to PC USB port, I can enlarge and view it in LCD Monitor for editing and discussion. 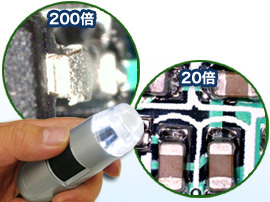 Furthermore, it has 4 white LEDs built in that provide great visibility even in dark environment. With a dimension of 120mm X 33mm X 33mm and weighted at merely 100 gram, it is a great gadget that is ideal for all levels of profession. Just use your imagination and I am sure you will enjoy the fun besides the benefits that it brings!